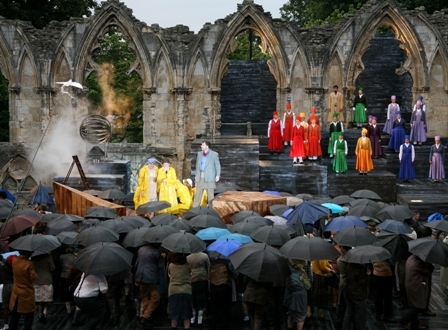 York Mystery Plays in the Museum Gardens in August 2012 were produced by York Theatre Royal and the Riding Lights Theatre Company. Some 1000 people and two professional actors were involved. Staff and volunteers kindly gave information and material to this NCEM archive. Photographs of the rehearsals, taken by local volunteers, are on Flickr. Below is information about the scenes and the alternating casts (the Potters and Carpenters). Go to this page for twenty photographs from the Museum Gardens production (NCEM has many more photos). Go to this page for photographs of wagon plays produced in 2012. Go to this page for an article from The Stage about building the theatre. Angels: Jane Allanach, Grace Armer, Claire Burgess, Jane Clarkson, Amelia Cook, Melanie Dagg-Thompson, Molli Duffin, Louise Gilpin, Clare Halliday, Sally Harding, Liz Hutchinson, Angie Millard, Brenda Mitchell, Naomi Noda, Claire Robinson, Marilyn Vihman, Anjali Vyas-Brannick, Lucy Walker. Montgomery Grenyer, Naomi Halliday, Holly Hardstaff, Amy Helliwell, Lissy Hopwood-Robinson, Jordan Hutchinson, Sarah Hutchinson, Jasmine Hugo, Jessica Hugo, Sarah Judge, Rosie Latimer, Imogen Little, Kathleen Livings, Thomas Lister, Laura McCarthy, Elizabeth Mae-Starbuck, Nikki Merrett, Rosie Mitchell, Hazuki Mogan, Minori Mogan, Jenny Moulds, Princess Ndlazulwana, George Orpe, Liam Precious, Shelly Reed, Frances Rigby, Olivia Robinson, Daisy Rowley, Imogen Rowley, Jemima Rowley, Scarlett Rowley, Owen Sandles, Emilia Sellars, Paige Sellars, Hannah Selvaratnam, Thomas Sheen, Naomi Simon, Daniel Simpson, Matilda Smith, Rosie Starkey, Oliver Steame, Grace Teer, Rhiannon Thrush, Sophie Tyler, Robyn Wade, Sophie Walmsley, Aled Vernon-Rees, Chloe Wright, Charlotte Young. Audrey Brown, Matt Capaldi, Sophie Cockman, Julia Cormack, Helen Douglas, Josh Elcock, Lance Elcock, Iain Fell, Adrian Fox, Matt Hardy, Peter Jesse, Ashley Lawrence, Kate Lock, Ed McCartney Moore, William McCartney Moore, Josh McCoy, Karen Nichols, Sandra Pearson, Chris Stockton, Sarah Stones, Caroline Tucker, Katie Wannop. Heather Hewitson, Lesley Hick, Sharon Hill, Carol-Ann Hooper, Kerin Hulse, Kate Hymans, Linda James, Diane Kirk, Rosemary Kirkman, Judith Lawrence, Louisa Littler, Alison Loftfield, Fiona Long, Livvie Lordan, Maggie Love, Malcolm Maddock, Rebecca Magowan, Barbara Marshall, Gill Martin, Louise Martin, Felicia McCormick, Janet McCullough, Alice Mcfarlane, Jacqui McGuinn, Karen Millar, Susan Mistry, Shino Mogan, Jenny Monaghan, Dave Moores, Dawn Moores, Susana Morvan, Caroline Mozley, Ruth O'Kelly, Caroline Parker, Liz Paterson, Anu Priya, Shirley Reay, Jane Reed, Brenda Riley, Joanna Roberts, Barbara Robinson, Emily Rowan, Elizabeth Savage, Janet Sharpe, Joan Sinanan, Barbara Smith, Sheila Smith, Ted Smith, Maggie Soper, Julie Speedie, Alice Stanley, Caroline Stockdale, Lucy Thorpe, Kate Vernon-Rees, Juliet Waters, Glynis Wear, Virginia Wedgwood, Beryl White, Sarah Wollny, Evelyn Wood, Julie Wood, Ilona Woodhead. - to emphasise the universality of the plays and their message, the cast wore costumes with a 1940s and 1950s flavour. The choice was particularly inspired by Stanley Spencer's well-known paintings of Biblical scenes incorporating images of real people from his home village of Cookham. - the spectrum of cast members was considerably broadened by the inclusion of a large number of children and young people, giving a refreshing and sometimes unexpected aspect to the performance! - the striking live performance throughout the play of specially-composed music performed by a 70-strong choir of local people and a brass band. All of this was intended to create an unforgettable experience." 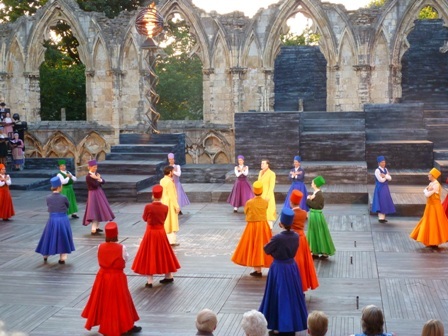 A play was written by Ged Cooper about the experience of being in the 2012 cast: see this link to the York Press. Here is a link to a Youtube film about community involvement in the production. Interested in other casts? This page has a cast list of the Millennium production in York Minster (2000): you will see some of the same names! And this page has photographs of the Millennium production. This page has the cast list for the 2016 Minster production. This page gives the names of the people in key roles since 1951. The NCEM has all the programmes and all the names. Next page: What are the Mystery Plays?